Standard - $208.99 Only 6 left! This is it. You’ve been waiting for this day for months. It’s time to go big or home. Are you ready? Have you prepared? Are you going to come through, or fail at the last minute? You know the importance of this day. You know it’s make or break. The way you handle this one day will determine whether you secure lifelong happiness or die bitter and alone. We’re talking about Valentine’s Day. Everyone knows how important Valentine’s Day is. If you don’t prove conclusively, creatively and extravagantly how much you love your significant other, they’re certain to leave you right then and never come back. You’ve got one shot. You can’t blow this with half-hearted gestures like a flimsy box of chocolates or cliché bouquets. What are you planning, tiger? We hate to break it to you, but cute isn’t going to win any hearts today. You need to up your game, son. If you’re going to buy that special someone a teddy bear, it better be the best teddy bear in the whole world. It better be huge. It better be adorable. It better be something that no one has ever seen before. Lucky for you, we’ve got you covered with this Teddy Bear Mens Mascot Costume. We promise that your special someone has never seen anything like this before. And the best part of this present is—you’re inside! So they can cuddle with their favorite stuffed animal while cuddling with their favorite guy. The plush jumpsuit is super soft and includes a cute bear tail on the back, while the bear paws have slits in them in case your sweetheart wants to hold hands. And they will. 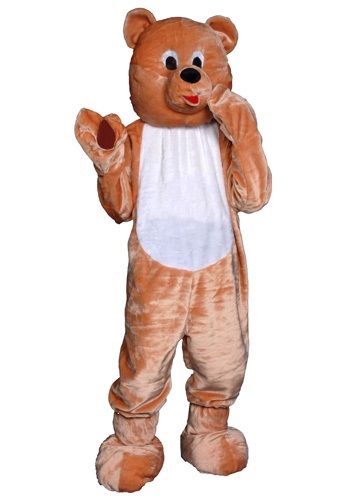 No one can resist this Teddy Bear Mens Mascot Costume. With this in your arsenal, we guarantee you will win Valentine’s Day. And that’s what this is all about. Oh, and something about love, too… we guess.